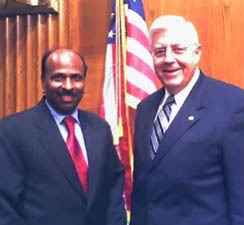 The U.S. Senate's Health, Education, Labor and Pensions (HELP) Committee gave unanimous and swift approval May 25, 2005, to S. 518, the National All Schedules Prescription Electronic Reporting Act (NASPER) bill, sending it on to the full Senate floor for consideration, according to Laxmaiah Manchikanti, M.D., chief executive officer of the American Society of Interventional Pain Physicians (ASIPP). "We are very pleased that this bill appears to be on track to become signed into law this year," said Manchikanti, who attended today's hearing. "It will be the first law introduced by a physicians' organization to become law." ASIPP support has been crucial to moving NASPER. The bill creates a federal grant program at the U.S. Department of Health and Human Services to help states establish and improve prescription drug monitoring programs to help control the diversion and abuse of prescribed medication, providing better and safer patient care. "This will help physicians detect abuse and prevent the practice of 'doctor shopping' for prescriptions of controlled substances across state lines," Manchikanti said. HELP Chairman Michael Enzi (R-WY) and Ranking Member Edward Kennedy (D-MA), the bill's co-sponsor, congratulated Manchikanti and ASIPP at today's hearing. Other organizations, including the American Medical Association and the American Society of Anesthesiologists, have supported the legislation. In the Senate, the bill is sponsored by U.S. Sen. Jeff Sessions (R-AL) with co-sponsors Lamar Alexander (R-TN), Christopher Dodd (D-CT), David Vitter (R-LA), Richard Burr (R-NC), Richard Durbin (D-IL), Jim Talent (R-MO) and Kennedy. The House bill (H.R. 1132) remains in the House subcommittee on health. A similar bill passed in the House of Representatives during the last session of Congress. U.S. Reps. Ed Whitfield (R-KY) and Frank Pallone (D-NJ) sponsor the House bill with 27 co-sponsors.